Abu Dhabi National Tanker Co., (ADNATCO), Abu Dhabi - white flag, in center the firm's logo. At ebay there is a copy of the flag of Arabian Maritime Lines Ltd. This company was formed in 1986 and was based in Sharjah with its ships being chartered out initially to the German company Norasia Schiffahrts GmbH and then to Mediterranean Shipping Co. S.A. who were initially an Italian firm but later became based in Switzerland. The flag is based on the Norasia format which can be seen, incorrectly, under Malta [I sent a long comment on them last year outlining their somewhat complex situation which has not been actioned]. The complexities of domiciling a company when charterers and managers and agents are involved and can be based in different countries has lead to Arabian Maritime Lines Ltd. being listed as a Swiss maritime company on the page "Swiss navy and Swiss flags at sea" but Lloyds gives Sharjah. The same mislead is given by the Nüsse site with the table flag which was presumably obtained through the Swiss Norasia subsidiary. By the format there was a connection between the two, but as Arabian Maritime apparently no longer exists and Norasia has disappeared into a merger, this remains unsolved to me. Gulf Agency Company (GAC) introduces itself as "the world's leading provider of shipping, logistics and marine services wherever you go." GAC was founded in 1956 in Kuwait by a group of Swedish shipping specialists. Its networks covers today all five continents. In January 2002, GAC shifted its corporate headquarters from Athens to Jebel Ali Free Zone, Dubai. Dubai has long been the home of GAC's largest operations base. 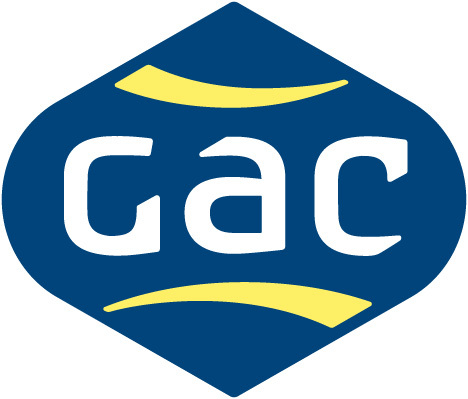 The house flag of GAC, or at least the flag shown on the company logotype, is blue with a yellow elongated hexagon charged with the red letters GAC. I guess that the blue and yellow colours recall the Swedish origin of the company. GAC has a new logo now.